What are the Top Outdoor Living Trends in 2014? Gone are the days of lawn chairs on a concrete slab in the backyard, in are the days of beautiful outdoor living spaces. The American Society of Landscape Architects (ASLA) recently released the results to their annual Residential Landscape Architecture Trends Survey. Each year, the ASLA surveys residential landscape architects about what aspects of outdoor living will be big for 2014. I must say, we at Archadeck Outdoor Living aren’t that surprised, but that doesn’t mean we aren’t excited by them! The survey is lumped into different categories. Number two in the Outdoor Design Elements in category is outdoor living spaces (kitchens, entertainment spaces, etc). 92% of the surveyed landscape architects said that outdoor living spaces will be popular or somewhat popular in 2014. At Archadeck Outdoor Living, we’ve been building custom outdoor structures since 1980, but we’ve seen an evolution of what that means in the last 5 to 10 years. What once was thought of just a simple deck is now considered an outdoor living space that serves a particular purpose. More specific is the Outdoor Living Features category of the survey. The ones that we are often asked about the most are seating and dining areas (97.7%), fire pits and fireplaces (95.4%), grills (94.3%), and installed seating (89.6%). Not surprisingly, this goes well with outdoor living spaces, as to have a useful space it has to fulfill a need. The features are what make them living areas and not just a structure. Nancy Somerville, ASLA Executive Vice President and CEO explains the interest in outdoor living: “Homeowners known that designed landscapes add value to their lives as well as their property values…They’re interested in livable, open spaces that are both stylish and earth friendly.” Source. When designing a structure for a client, we at Archadeck Outdoor Living talk to the homeowner about the way the space will be used and how they envision it flowing. With the goals in mind, we can create a patio or deck design complete with the features to make the backyard of the client’s dreams. If you have any questions on designing outdoor living spaces, please contact your local Archadeck Outdoor Living office. For over 30 years, Archadeck Outdoor Living has been designing and building some of the most beautiful outdoor living spaces. We’re truly passionate about outdoor living and are thrilled to announce the launch of a new electronic magazine that shares our love: Loving Outdoor Living. 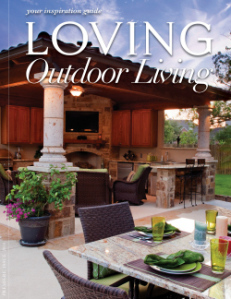 Loving Outdoor Living is a free e-publication focused on all things outdoor living. It’s great for anyone who’s planning updates to their outdoor spaces or just enjoy being outside! Archadeck Outdoor Living teamed up with its sister brands, Outdoor Lighting Perspectives, Mosquito Squad, and Renew Crew to launch the premier issue, available here. Articles cover all things outdoors including: vacation spots, enhancing your outdoor comfort, entertaining, recipes, lighting, mosquito control and fashion! Loving Outdoor Living is a growing resource for the outdoor living industry both with the publication, but also with its growing blog. It starts and ends with you. Our projects are not one size (or design) fits all. An Archadeck project starts with an at home consultation with you to discuss your needs and wants for the space. We’ll walk your property with you and discuss options that will fit your home’s architecture and the surrounding property. After the consultation, we’ll design a space based on that conversation, and we’ll show you the design in a 3D rendering so you can envision the space easily in your backyard. Once the design is agreed upon, we’ll build the project with the best quality products. From beginning to end, you’ll experience the Archadeck difference. If you have any questions, please contact your local Archadeck office. Whether you are buying a car, hosting a party or building an outdoor living space, the details matter, and they can make a big difference on the final outcome. From colors and texture to shape and space, choosing the right finishing touches can take an OK outcome, to something you love. This screened porch from Archadeck of Fort Wayne is a great example of a space where the details created a warm space for the family to spend time outdoors. Before we talk about the great details inside the porch, let’s talk about the outside. As always, one of our goals at Archadeck is make sure the project doesn’t look like an afterthought. 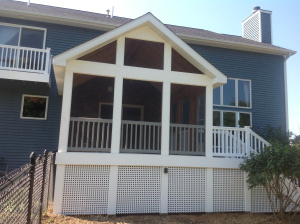 Baron Biedenweg of Archadeck of Fort Wayne used white on the outside of the porch to match the white trim of the home and installed the same railing around the screen porch and deck as was used on the small balcony off the second level of the home. Keeping the colors consistent makes sure that everything works together. For me, the finishes inside the porch is what makes me want to have a drink or read a book in the room. Screened porches are a unique type of space because they really are both indoors and outdoors. screened-porch-designYou are inside a structure, but outdoor-friendly materials have to be used because rain, pollen and some other outdoor elements can get inside. Many homeowners choose to keep their siding on the wall that attaches to the porch to the home because it 1) matches and 2) is weather-proof. In this screened porch, however, Baron used a stone veneer on the wall. It makes a statement visually, but the warm tones also make the porch cozy. There is a vast variety of flooring options for screened porches. I love how the wood flooring was finished in this space to feel like an extension of the indoor living space. It was treated with a shiny finish to mirror the floors that run throughout the home. That detail makes the transition from inside to outside even smoother. When discussing your screened porch or other outdoor living space with your designer, make sure you tell them what mood you want to set in the finished space. From warm and relaxing to vibrant and full of fun, choosing the right finishing details will help you accomplish your goals. If you want to talk about ways to enhance your outdoor living areas, please contact your local Archadeck Outdoor Living office. When it comes to designing a new outdoor living space, one thing to think about is what square footage the project gives you. For many of our clients, they want to add to the usable living space to their property, and decks, patios, porches and other outdoor living spaces is a great way to do. 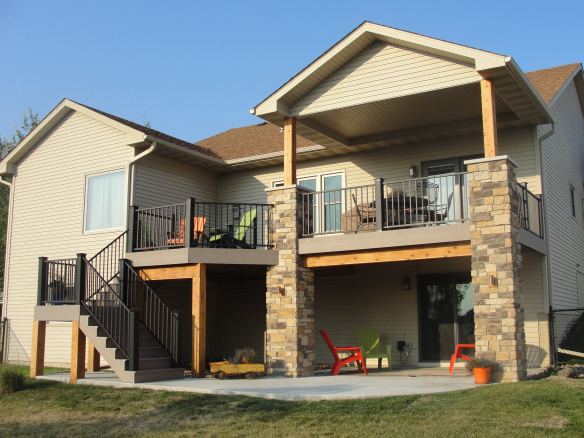 I was looking through some images of some of our locations recent work when I came across this great elevated deck in Des Moines. The homeowners were in need of an updated space when their current deck started to show its age. With their new outdoor living space, they wanted just that: space. Lucky for them, they reached Harold Cross of Archadeck of Central Iowa. The old porch felt and looked like an isolated space. The homeowners really wanted to utilize the elevated space as well as space lower down. Harold redesigned the open porch area to flow onto a deck without a roof and then down to a patio. The main living area of the home is elevated in the back. They need an elevated space so they don’t constantly have to go downstairs to spend time outdoors. The covered area provides shade and frames a great outdoor dining space, right off the kitchen. 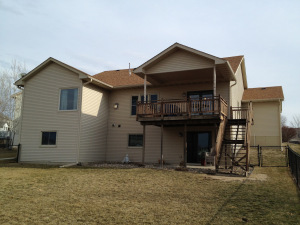 One step down from the covered porch is an open deck where the homeowners can enjoy some sunshine. While the first space just had a covered area had a covered porch and then stairs heading down, this open deck provides an easier transition to the stairs and to the lower level. The lower level consists of a patio that is partially covered. At Archadeck, we like to take advantage of the space created by elevated decks to craft additional living space. We use a process called under-decking to keep the space dry. 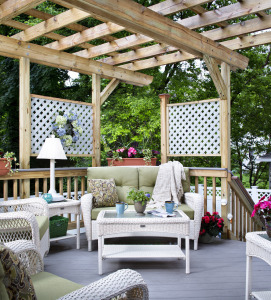 Just like the open deck above, the open patio is both usable and a great transitional space. Without this part of the patio, the two levels would be too separate and wouldn’t work together like they do now. Harold and his team designed and built this outdoor space to not only function extremely well, but it’s beautiful too. 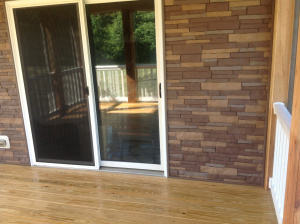 The colors of composite decking and the stone complement the home wonderfully. If you have questions regarding outdoor living design, please reach out to your local Archadeck office.